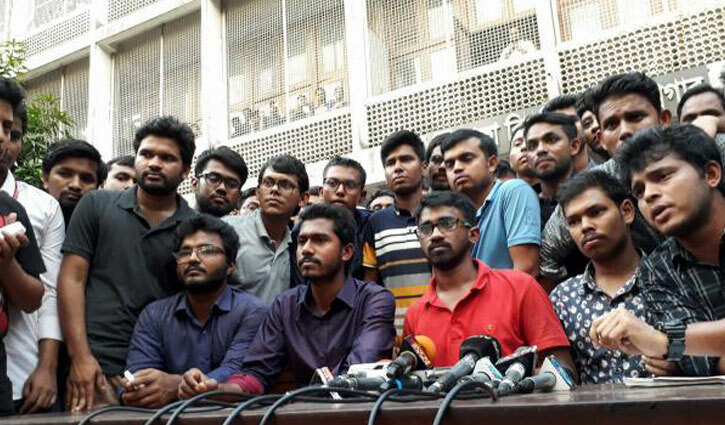 Staff Correspondent: Bangladesh Sadharan Chhatra Adhikar Sangrakkhan Parishad has postponed their agitation till May 7, following an assurance that the gazette abolishing the quota system in government jobs will be published very soon. They made the announcement after Awami League lawmaker Jahangir Kabir Nanak told them that the government would publish the gazette after the prime minister's return from abroad. A 14-member team of Bangladesh Sadharan Chhatra Adhikar Sangrakkhan Parishad, the platform which led the protest, went to Nanak's NAM Flat on Manik Mia Avenue on Friday night and held a meeting there. Earlier on April 26, the quota movement leaders warned that they would resume agitation if a gazette notification was not published by April. Prime minister Sheikh Hasina is now in Australia and will return home on 30 April.